A short update and the end of a chapter – 7 Dec 2014. To reflect that this blog has become about more than just restoring Rhino, I’ve updated my “home” and “about” pages and the site title. I will have to do some work soon on the Tonti info page to include the American market bike frame numbers. I’m also compiling a list of English language magazine articles about the big block Tonti 750s and the loopframe bikes. I’ll add this to the site somehow and post links or copies of what I’ve got. Well, I’ve still not been able to do any more to Rhino, the V7Sport. I’m pretty frustrated that my wrist hasn’t got back more than about 50% movement so far despite my and the physiotherapists’ best efforts. Maybe I’m expecting too much too soon. The accident was three months ago today. There’s no way I can ride as I can’t grip and turn a twistgrip far enough. I give it a go most days as an extra physio exercise! I’m restricted to fairly light work so I’ve taken a look at the wiring on the V7 700. I think I’ve got 8 wiring diagrams for loopframe Guzzis but it’s none of them and it turns out to be a combination of 2. So I’ve made a drawing and now I understand what does what. The original wiring is all good but, whoever added the turn indicators was no expert, to say the least. When I took the headlamp off I found the flasher relay carefully covered in bubble wrap so that it couldn’t short anything out as it bounces about. The wires to the switch on the bars is mains flex and the wiring to the rear indicators looks like speaker cable. The connections inside the headlamp shell are made by just twisting the cables together. I think I’ll wire the winkers from scratch and put the flasher relay in the battery compartment as there’s not really enough room in the headlamp. I’ll also probably change the indicator switch so that the right hand mirror can clamp on a straight bit of the bars. At the moment it’s not very secure. In addition to the wiring, I’ve re-glued the edge of the seat cover. As the fuel tank was off, I looked at the taps and found that both will drain the tank to the bottom. So, there’s no reserve setting. It looks like this was normal. I’ll see if there is any way I can fit a standpipe to one of the taps to provide a “normal” position then use the other one for reserve. Otherwise I know I’ll get stuck. Finally, today I said goodbye to the S3. The new owner has already booked the frame in for straightening so hopefully it can then be rebuilt. I do hope so. Back in the garage again – 20 Nov 2014. (Sung to the tune of “Back in the high life again” by Steve Winwood). I have managed to spend some time in the workshop but mainly working one-handed. Rhino’s friend has been sold and a deposit taken. The intention is that the bike will be rebuilt and in all likelihood will end up better than it was before the accident. It had been my intention to restore it at some time and it seems this may yet happen. I have removed the front mudguard and its brackets and turned the fork stanchions through 180 degrees so that they now point forward and the wheel is clear of the engine and exhaust. The wheel turns but the tyre just scuffs the right hand fork lower at one point. It will, however, now be possible to move the bike. The S3 type seat has been fitted and boxes filled with whatever I can find toward producing a 750 engine. Assessing the damage – Part 2 – 7 Nov 2014. What’s good, what’s bad and what’s non-standard. I’ve already described what the frame is like! Forward of the steering head. This is obviously where the majority of the damage is so I have listed this separate to the rest. Front wheel – the rim is bent and the front tyre will need to be replaced. Brake disks – Left hand is broken. Right hand looks OK.
Front brake calipers – both look OK.
Top fork yoke – appears to be OK.
Lower fork yoke – the yoke itself looks alright but the steering stem which is pressed into it is likely to be bent. Fork lowers – both OK. Fork stations – both bent. Fork internals, dampers springs etc – I assume the dampers are bent. Front mudguard brackets – both look to be OK but are a bit rusty. Front mudguard – has had it. Brake line to front RH caliper, braided – crushed. Brake line to front LH caliper is OK.
V7Sport handlebars fitted – both bent. RH is creased. Modified Tommaselli headlamp brackets fitted. Both bent. V7Sport chrome headlamp fitted – is scrap. Aftermarket front indicators fitted – busted. Grimeca front brake and master cylinder fitted – probably are ok.
Tommaselli 2C throttle – OK.
V7Sport start button and bracket fitted – OK. Hydraulic brake light switch at lever – is leaking. Stainless bar end mirror – dented. Instruments and housing – are OK.
LH switchgear from a later Guzzi fitted – looks OK. Steering damper and its gear – look OK.
Engine, gearbox and rear drive. 850T4 engine is fitted. Mileage unknown but has done about 20,300 miles since I bought it in 2002. That’s about 10K in the V7Sport and another 10K in the S3. It has a steel timing gear set as per the earlier Tonti bikes with a modified oil pump gear so it will fit on a later oil pump shaft etc. I don’t know where this was produced as it was fitted to the original seized 750S3 engine when I bought the bike. Alternator cover is dented and cracked. One fixing screw is snapped off in the timing case. It has been like that for the whole time I have had this engine. I have removed the cover and checked the alternator which seems fine. Left hand rocker cover has some minor scuff damage. RH is OK.
Fins on cylinder heads and barrels are not damaged. Although the exhaust has taken a knock, the fixing studs in the cylinder heads appear to be OK.
Rest of the engine is in the condition you would expect for its age. Carbs are from the T4 and are fitted with flip chokes and still breathe through the original rubber air box. Gearbox is the original and works. Driveshaft and universal joint should be ok. UJ checked about a year ago. Header pipes are T3 type and look to be undamaged. Cross over pipe also T3 type. 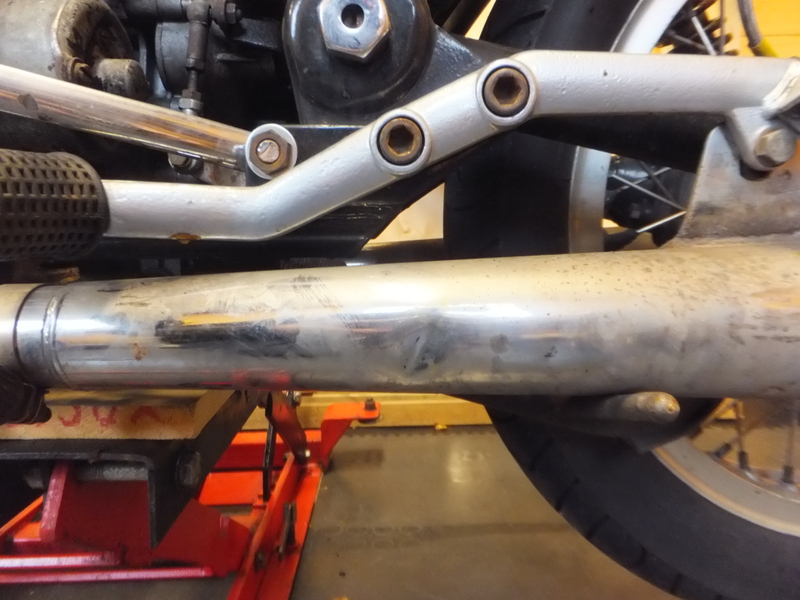 Rear silencers are Busso – chrome is bad although they are nowhere near rusted through. LH one has a small dent. 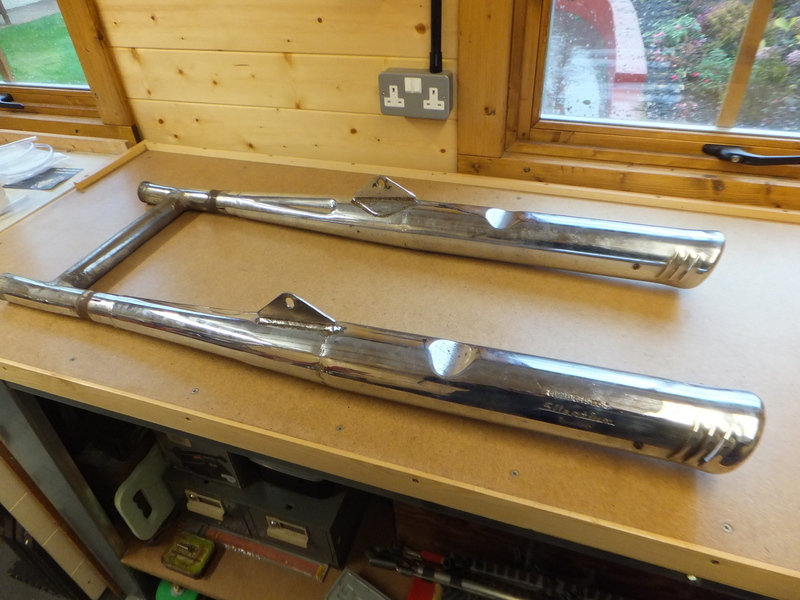 Front crash bars – both scuffed but look straight. Footrests and carriers – OK.
Gear linkage and pedal modified to take a rose joint – OK.
California style side stand and lower frame rail fitted. No ignition cut out – OK.
Rear brake lever and linkage – OK.
Rear grab handles are ok but chrome is not good. Swing arm and bearings – OK.
Rear shocks are Koni dial-a-rides. Whole system appears to be sound. Braided brake lines fitted. Is the original and is sound. Pirelli Sport Demon tyre fitted in May 2014 and has done about 1200 miles. Fuel tank is the original. There is a scratch to the LH side which has gone through the paint and dented it. The Guzzi badges are held on with double sided tape as the original mountings are gone. Fuel taps are OK. The side panels are original and have some paint damage. Original badges fitted. 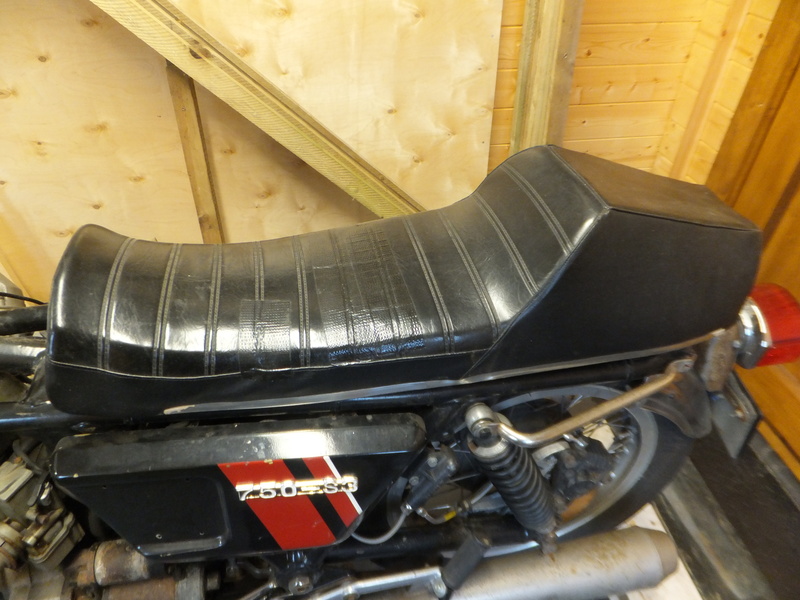 The seat that goes with the bike is not that shown in previous pictures but is the original S3 type and is tatty. Rear mudguard is original type as is tail lamp and bracket. Rectifier and fuse box are behind RH side panel as per original. Ignition coils are with the relays behind the LH panel and not under the tank. Ignition switch and holder are ok. Still running points ignition system. A one-off wiring loom was made up to match the non-original parts fitted and layout (no kill switch etc). There are no rear indicators as these were part of the rack destroyed by the storage company. There are some parts that can go with the bike if they’re wanted. The original lower frame rail but no stand. Grills for the side panels. Bought but never fitted. Pair of Silentium “shark gill” silencers. I was going to have these coated black for this bike as per original. There is a modified T3 type cross over to allow these to be fitted to T3 headers but it’s a bit rusty. The original VK-series main engine case. I was going to rebuild the T3 engine with this case to get back the original S3 engine number. There are also S3 cylinders and pistons and various other engine parts but no crank, main bearings or camshaft. No flywheel or clutch. Chain driven timing set originally in the T4 engine. I think that’s it. Although I won’t be held to the damage being limited to that shown above and, please note that, when I say that a part is OK that doesn’t mean it’s pristine. Just that it appears undamaged to me. Some parts are cosmetically challenged. This was a bike that was ridden and not a show bike. As I have said before, I’m not going to rebuild this bike. I know it’s a shame as, although modified, it’s a classic and was actually nicer to ride than Rhino, the V7Sport. Despite this, I don’t have the finances to maintain three classic Guzzis so it’s best to try and pass this on to someone else. I’ll list it on the UK based Guzzi forums with a link to this post and the last one so people can see what’s what. Someone could be interested in rebuilding or making an S3 replica and might make a sensible offer. 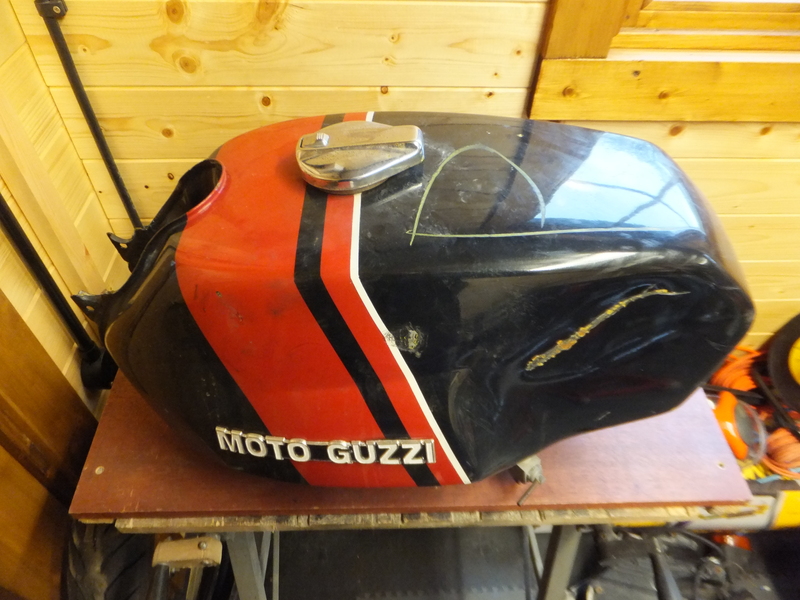 I know the value of secondhand Guzzi spares and, if I don’t get an offer, I’ll break it.